It’s no secret that Mr. Crumbs has a sweet tooth. It’s important that I keep a variety of sweets in the house to satisfy his cravings when they randomly appear, otherwise my budget will be blown to smithereens. At least he leans towards chocolate baked goods and ice cream, and it’s fairly easy to keep ingredients on hand for whatever baking request he comes up with. Last week – out of the blue – he asked if we had chocolate pudding and cool whip. With a partial smirk (because I had no plans to buy either) and a partial smile (because I knew what was coming), I asked him why. He was in the mood for a chocolate pie, or something similar. We opened our worn and food-spotted Joy of Cooking and found two recipes that did the trick – homemade pie crust and chocolate pudding. Checking the pantry, we had everything needed for both. Once you taste this rich, smooth, deeply chocolate pudding, you will never go back to a mix. Nor should you, by the way, go back to a mix. There are a few ingredients listed as thickeners, sweeteners and stabilizers that have been linked to cancer (aspartame and carrageenan namely). I’m not a medical professional and I don’t know for sure whether or not eating a serving of instant Jell-o pudding will directly give you cancer, but if there’s even a slight chance that it could, why put ourselves and our families at risk? This pie crust is also our go-to crust when we’re making any sort of pie. It’s a cross between pastry and shortbread, and absolutely delicious. The cheapest shelf price I’ve seen for pie crusts (including sales) is $2.50 a piece. Butter will be the most expensive ingredient in the crust, but even using organic butter puts the crust at $1.50. Preheat oven to 400 degrees. 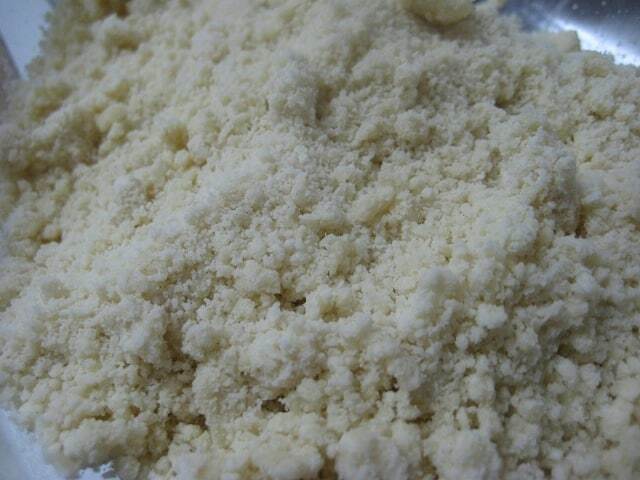 In a large bowl, combine flour and salt well. Add the pieces of butter and working quickly, use your fingers to mash the butter with the flour so that the mixture resembles coarse bread crumbs. Take care not to make a paste with the butter, nor allow the butter to melt. Drizzle 2 T of the cream over the breadcrumbs and again use your fingers to mash together. Your crumbs should look damp and should hold together when pinched. Use the remaining 1 T of cream as necessary. 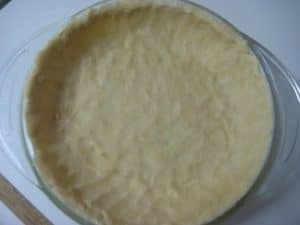 Transfer the mixture to a 9-inch pie pan and starting from the center and working outwards, pat the mixture evenly over the bottom of the pan using your fingertips. Try to make the crust as even as possible throughout. Continue to pat the crust up the sides of the pie pan. If your crust is thin in some parts, check the corner of the pan (the crust tends to be thicker there). You can also remove overhang from one side and pat onto another area if necessary. Prick the bottom and sides of the crust with a fork and bake for 18-22 minutes, until the crust is golden brown. When the crust is done, it can be filled with any filling that does not require additional baking. Optional: If your pie filling does require additional baking, whisk together the egg yolk and pinch of salt and brush the inside of the crust. Bake for an additional 1-2 minutes until the egg glaze sets. The crust is then ready to be filled. 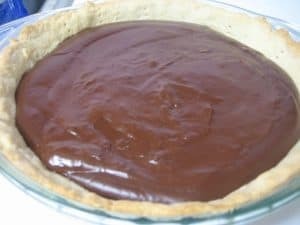 I did not do a cost comparison on the chocolate pie filling, but don’t pass this up if you have 30 minutes – that’s how long it took to do the ENTIRE pie, start to finish, crust and all. (But not including chilling time, of course). Combine cornstarch with ¼ cup half & half. Set aside. Combine sugar, cocoa and salt in a heavy saucepan. Gradually add water, stirring to make a smooth, runny paste. Stirring constantly, bring paste to a boil over medium heat and then remove from heat. Add semisweet chocolate and stir quickly until melted. Thoroughly stir in 1 ¾ half & half. Add the cornstarch mixture and stir to thoroughly combine. Bring this mixture to a boil over medium heat, stirring constantly, until the mixture thickens. When the mixture is thick, cook for one minute while stirring and then remove from heat. Add vanilla and stir well. Pour pudding over pie crust and cover with plastic wrap to prevent a skin from forming. Refrigerate for at least 2 hours. Serve with whipped cream. Recipes adapted from Joy of Cooking. Chocolate pie is one of those dishes that is always better homemade. Thanks for sharing! Well, I’ve put this on my pinterest board for the holidays…now i just have to restrain myself from making it right now! Chocolate pie has been one of those elusive deserts in our family, it’s just never as good as nana used to make it. Can’t wait to try out your recipe and see what everyone thinks! If you have chocolate lovers, you won’t go wrong. I’m not even a fan of pudding-esque stuff and this pie was awesome! That pudding looks awesome! Love it! Thanks for sharing at Church Supper. Have a blessed week & come back soon. Thanksgiving menu here we come…love it! Ah, that would be a good add to ours as well! I LOVE homemade pies! They taste so much better than anything store-bought. Thanks for sharing this recipe! I’m sure the 1/2 and 1/2 makes it taste extra rich, it looks so good! I’ve been making chocolate pudding (with peanut butter) in the microwave and it’s really fast and easy. Chocolate and peanut butter pudding in the microwave – that sounds deliciously disasterous to my waistline!! Mmm! I love chocolate pie. In fact, my favorite chocolate pie recipe also has figs mixed in. Homemade chocolate pudding pie sounds fantastic. 100% of the puddings in my house are homemade, mostly because I prefer the flavour, and on occasion because only about 3 flavors (excluding chocolate, imagine that!) are available at 1 supermarket here in Costa Rica. Thanks so much for sharing your recipe, Tiffany! Found you from Works for Me Weds. Don’t tell my husband you’re in Costca Rica! He wants to move there SO bad! I love that since your limited at the store, you make more from scratch! Thanks for coming by Katie! OH YUM!!!!!! I need to try and make this pie along with the homemade crust! That looks delish! Chocolate pie is the best! And your crust looks perfect! Thanks for sharing at the Pomp Party! This looks so good! 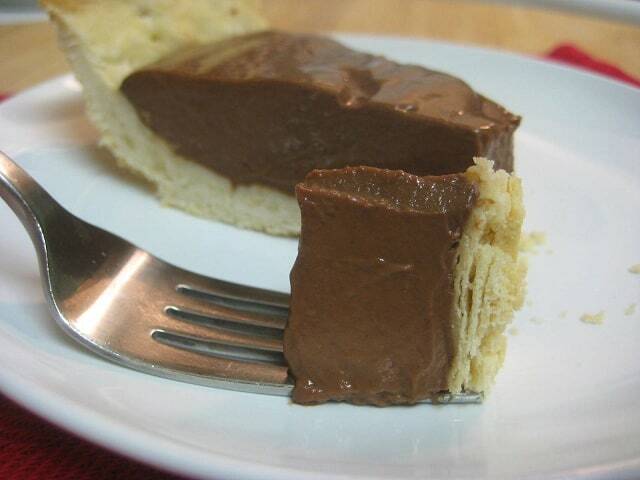 I don’t think I have ever had chocolate pie before – I will definitely have to try it now! Thanks so much for coming out to the party at Clean and Scentsible. I’ll be featuring this tomorrow. Enjoy your Sunday! Thanks for the feature Jenn! This is definitely a pie you don’t want to skip! This is sure a great Chocolate pie. That filling looks delicious really rich and creamy. Hope you have a great week and thank you so much for sharing with Full Plate Thursday. This looks amazing! Chocolate pie is my hubby’s favorite. Thanks so much for linking up to Creative Thursday. Can’t wait to see what you share this week! Have a wonderful week. Thanks for sharing. I made this with the kids…yummy!! “This is better than the pie store! !” according to my 4yr old dd!! She experienced her love for chocolate pie when my parents took her to dinner @ Marie Calendar’s!! If a 4yr old says it’s good, you know it must be! What a compliment! And ain’t that crust a cinch?! Can’t wait to make my own pie too (little jealous you’re already indulging! 😉 ). do you think i could use arrow root powder instead of cornstarch?